After the Poltavka period, population change occurred in Samara: the Late Bronze Age Srubnaya have ~17% Anatolian Neolithic or EEF ancestry (Extended Data Fig. 2). Previous work documented that such ancestry appeared east of the Urals beginning at least by the time of the Sintashta culture, and suggested that it reflected an eastward migration from the Corded Ware peoples of central Europe5. However, the fact that the Srubnaya also harbored such ancestry indicates that the Anatolian Neolithic or EEF ancestry could have come into the steppe from a more eastern source. Further evidence that migrations originating as far west as central Europe may not have had an important impact on the Late Bronze Age steppe comes from the fact that the Srubnaya possess exclusively (n=6) R1a Y chromosomes (Extended Data Table 1), and four of them (and one Poltavka male) belonged to haplogroup R1a-Z93 which is common in central/south Asians12, very rare in present-day Europeans, and absent in all ancient central Europeans studied to date. This represents a direct link between the European steppe and central/south Asia, an intriguing observation that may be related to the spread of Indo-European languages in that direction. Actually, several Corded Ware samples from previous studies carried the M417 and Z645 mutations, which are ancestral to Z93. So who's to say that the main patriarch of the Sintashta and Srubnaya cultures, both of which appear to have been rich in R1a-Z93, didn't live somewhere within the Corded Ware horizon, even as far west as Germany or Poland? In any case, it's nice to see academia finally mention R1a-Z93 in the context of the Indo-European expansion into South Asia. I've been saying for years that this looks like the marker of the Proto-Indo-Iranians and Proto-Indo-Aryans (see here and here). Fascinating stuff. Anyone know if similar Sundial-Moondials dating to the Bronze or Iron Age have been found in South Asia? What so you think about the origin of R1a-L657? L657 is typical for Indo-Aryans except of Kalash which mysteriously carry Z2124 rather typical for Iranics. It seems that Proto-Indo-Aryans were mainly L657 and Proto-Iranians mainly Z2124. L657 is totally absent everywhere in modern Europe and North Eurasia unlike Z2124. It is obvious that L657 is from Abashevo and entered South Asia from Andronovo via BMAC but all Sintashta, Andronovo and Srubnaya samples lacked L657. Unfortunately they forget to test a lot of the Z93 folks for downstream markers but all tested for downstream markers were Z2124+ . Indo-Aryans were the first ones who got in contact with Uralics and the oldest Indo-Iranian loanwords in Uralic languages have an Indo-Aryan and not Iranian origin. I think L657 will show up in Potapovka remains when more samples are tested. Makes also sense. Potapovka folks practiced some Vedic-like rituals but you probably already heard of that. "Most tellingly, perhaps, at the site of Potapovka (N. Krasnoyarsk Dst., near Kuybyshev on the N. Volga steppe), a unique burial has been found. It contains a human skeleton whose head has been replaced by a horse head; a human head lies near his feet, along with a bone pipe, and a cow's head is placed near his knees. This looks like an archaeological illustration of the Rigvedic myth of Dadhyañc ,whose head was cut off by Indra and replaced by that of a horse. The bone pipe reminds, as the excavator has noted, of the RV sentence referring to the playing of pipes in Yama's realm, the world of the ancestors (GENING 1977). I Just can't imagine what will happen when the SC Asian aDNA comes up. L-657 will not be found from Europe, the Mutation Z-93 has Asian origins. Kalash belongs to the Indo-Aryan branch not Iranian. all cultures were obsessed by the sun and moon. They did not have watches and smart phones. The need to tell time is universal. Myths and rituals surrounding stellar objects are often genetically related but predate PIE hugely. "What so you think about the origin of R1a-L657? L657 is typical for Indo-Aryans except of Kalash which mysteriously carry Z2124 rather typical for Iranics. " It is strange that everyone from Srubnaya to Sycthians has Z2123. How do we explain other branches of Z93 today? Could this mean R1a-Z93 is very old and has a differnt history in differnt regions? Possible. But still I don't see how what archaeologist consider Indo Iranians can be uniformly Ra-Z93 and not ancestral R1a-Z93 in Asian Indo Iranian speakers. Plus, Davidski has found the best proxy for the West Eurasian ancestors of S-C Asian IE-speakers are Bronze age Steppe people. Potapovka was not tested for Z94 downstream markers so they could also bd Y40 Or L657. It is not surprising that Srubnaya is only Z2123 because Srubnaya is rather late (1900-1200 BC) and probably ancestral to North Iranians. Proto-Indo-Aryans (likely mainly L657 carriers) were the first Indo-Iranians which moved to Central Asia, South Asia and the Near East. So we need to search L657 among the oldest Sintashta/Potapovka/Andronovo sites. We just have few samples from Sintashta and Andronovo and the Andronovo samples were from the most northeastern part of Andronovo so they are not very representative. The Z93 guy from Poltavka is a genetic outliner and carries significant EEF ancestry. He was also not tested for Z94 downstream markers so he could also belong to L657 or Y40 for example. I don't think that L657 originated very far away from Z2124/Z2123. It is also possible that the first Proto-Indo-Iranian cultures were a mix of various Z94 lineages and that just later one lineage became dominant in one culture because of founder effects and bottle necks. How do you know Potapovka's Z94 was not tested for downstream clades? Did supplementary info mention that? 8/8 ancient Z93s that found their deep subclade are Z2124. Add to that 3/3 Iron age Z93s are Z2124. Maybe L657 was there. Or maybe it was in another closely related group. A non-Steppe origin is another possibility. I'm considering everything and the dominance of Z2124 should not be ignored. This could be a similar situation with R1a-Z283 in East Europe and R1b-U106 in Scandinavia. All Bell beaker R1b so far is P312, so one could propose U106 has a differnt origin. The only Z283 in Corded Ware is in Sweden and is Nordic-specific Z284, so one could propose other Z283 has a differnt origin. All Z93 samples so far are genetically really western shifted compared to Yamnaya. Sintashta for example was more western shifted than Erzya, Mordvins and other europid Uralics. That makes an Asian origin of Z93 unlikely and rather points to a West-East migration of Z93/Z94 starting from a place where they could take a lot of EEF wifes. The Poltavka R1a guy , who is also the oldest of the Poltavka samples, is genetically close to Srubnaya/Sintashta so he is probably representing an early intrusion of Z93 folks into Yamnaya/Poltavka and has the same origin like Sintashta/Srubnaya. Ok ,I assumed that because they wrote not anything specific about their R1a clades that they did not test them for Z94 downstream markers. But nevertheless L657 will be not found in Pre-Andronovo Central Asia for sure and absence of evidence is not evidence of absence. All the Z94 samples which were tested for deep clades are either very late or from peripheral places so that is not really proving that Potapovka could not be L657 or Y40. My own opinion about the absence of L657 is that L657 were either military destroyed by Z2124 carriers or immigrated in masses from their homeland because of a dramatic climatic shift. Both could play a role in that. There was a lot of hostility between Indo-Aryans and Iranians because of different religious views( Deva vs. Asura) and we know from Sintashta and Abashevo sites that intertribal was really endemic there. It seems that L657 folks were pushed out by Z2124 folks violently and moved towards new lands. A lot of lineages died out in the steppe and L657 likely also died out if they did not escaped southwards and eastwards. Don't forget that Vedic Indo-Aryans were pastoralist showing a lot of steppe culture elements and L657 can just a steppe/forest steppe origin everything else makes no sense in my opinion. You should start reading more works, works which thought things differently and quite correctly indeed, for the matter of Indo-Iranian as whole you can start by reading this. What is disappointing in his perception about the Indic culture? He seems to be on the right track and asking the right questions on the Indo-Iranian and haplogroup origins. Also, he is not dogmatic or obsessional. I agree, Z-93 is older than previously suggested. R1a-Z93/Z94 could not have existed among the native populations of both Eastern Europe and South Asia 2500-2000 BC. It's obviously from Europe and represents European admixture in South Asia. I had a lot of that discussions elsewhere and know that you and others would still claim a Z93 origin in Central Asia/South Asia even if we would find the grave of the Z93 patriarch in Europe. Some basal R1a or R1a similar to Xiahoe will maybe be found in Pre-Andronovo South Central Asia but Z93 surely not. Z94 in South Asia is not even really diverse and R1a even less (only Z93 almost no Z93-). Rig vedic Indo-Aryans were pastoralist warlike semi-nomadic Indo-Europeans showing a lot of parallels to other Indo-Europeans. They praised Indra as destroyer of forts and Vedic rituals show exact parallels with Sintashta or Potapovka. There is significant NE European admixture among Indo-Aryans and Jatts and even some Brahmins have in some cases more NE European DNA than Pashtuns or Tajiks. But both are mainly L657 and Z2124 is just carried by a minority among them so you need to explain how they got it as mainly L657 carriers. Oldest basal R1a is actually found today among few ethnic Poles and Russians. Z93* was not found in South Asia yet and just Z94* among one sample from Punjab. I previously also mentioned that Uralic languages have Proto-Indic loanwords certainly not of Iranian origin. But Scythians or Saka were Iranian-speaking and we don't know of any historical migration or presence of Indo-Aryans close to Uralics so in pre-historical times and prior to Scythians Proto-Indic languages were spoken not far away from Proto-Uralic languages. That is actually not really surprising because we knew already before than Indo-Aryans were the first Indo-Iranians which moved eastwards. BMAC is not relevant for the origin if Z94 and they were just Georgian-like teak farmers with a bit more ANE so they can be excluded as source for the EEF ancestry among Sintashta/Potapovka/Srubnaya. Yamnayas Near Eastern ancestry was more related to BMAC than that of Sintashta. Oldest basal R1a is actually found today among few ethnic Poles and Russians. Z93* was not found in South Asia yet and just Z94* among one sample from Punjab. Yes but they are bunk, The aDNA actually suggests intrusion from the east and authors are also indicative into that conclusion. Rig vedic Indo-Aryans were pastoralist warlike semi-nomadic Indo-Europeans showing a lot of parallels to other Indo-Europeans. They praised Indra as destroyer of forts and Vedic rituals show exact parallels with Sintashta or Potapovka. There is significant NE European admixture among Indo-Aryans and Jatts and even some Brahmins have in some cases more NE European DNA than Pashtuns or Tajiks. But both are mainly L657 and Z2124 is just carried by a minority among them so you need to explain how they got it as mainly L657 carriers. I think you haven't read the Article i gave you, its a pity. However, Well Autosomal components can't be dated so let aDNA talk on that. Well i can't tell why Z2124 is minority but obviously i can tell that in ancient times people didn't knew their SNPs you know, so imo L-657 is probably a southern specific branch where Z-2124 Northern. I previously also mentioned that Uralic languages have Proto-Indic loanwords certainly not of Iranian origin. But Scythians or Saka were Iranian-speaking and we don't know of any historical migration or presence of Indo-Aryans close to Uralics so in pre-historical times and prior to Scythians Proto-Indic languages were spoken not far away from Proto-Uralic languages. Yes IA similar population came into contact with them probably from BMAC ( see the article), no Uralics also have Iranian type loan words like Zaranya (gold). BMAC is not relevant for the origin if Z94 and they were just Georgian-like teak farmers with a bit more ANE so they can be excluded as source for the EEF ancestry among Sintashta/Potapovka/Srubnaya. Yamnayas Near Eastern ancestry was more related to BMAC than that of Sintashta..
You were wrong and admit that. I was also wrong about other things in the past and I admit that. You are probably not even Z94 because someone carrying it would not argue such kind of things and would have no problem accepting a European origin of it. The only question about L657 or Z94 we need to answer now is where exactly they were born in Europe/North Eurasia. Explain the high NE Euro admixture among L657 Jatts for example and how Indo-Iranians speak Indo-European languages if they are originally not from Eastern Europe? Sooner or later we will get ancient DNA from Pre-IE Asia and no Z93/Z94 will be found there just like no R1b-L51 was found in Neolithic West Europe. If Sintashta/Srubnaya/Potapovka picked Z93 from BMAc than tell me how they show no genetic links to Central or South Asia and were genetically just the same like Lithuanians? The Indo-Aryan loanwords in Uralic languages are much older than the Iranian loanwords because Iranians moved later eastwards and pushed Indo-Aryans out of the north. Nevertheless you show no evidences and just personal biases. BMACs were conquered by Indo-Aryans from the steppe and it seems that BMAC folks were seem by Indo-Aryans as Dasa. There was probably a lot of hostility between them just like we see it so often between Pastoralists and farmers. But one thing which is remarkable is that finding Z-94 from ~2600 BC (if i'm not mistaken), once it was concluded that its a post 1500 BC mutation, now we have its presence from over a thousand year old sample, i think this makes a reasonable possibility that Z-93 mutation is of ~3000 BC or even before! It was suggested by me that there is good chance of Afanaseivo being R1a, David also agrees with that, i wonder if they come out as Z-93!!! (there is also an equal possibility that it will be just M-417 or even R1b), then what we have to see if CWC shows any R1a-Z93 or not, things will get very interesting if Afanaseivo turns out to be Z-93. The Poltavka R1a guy was a genetic outliner and was very similar to Sintashta and Srubnaya. He don't clustered with Poltavka R1b and was probably similar to modern Ukrainians or Poles. His grave was also found in entire different site than the R1b Poltavka folks and he is probably just representing an earlier Indo-Iranian intrusion from the forest steppe into the steppe. He certainly had the same origin like Sintashta and Potapovka. Or basically it was IndoAryan similar group which made the 1st contacts, most likely because of trade related to metal industry etc, Iranians came late.. Yes of course read the article that is exactly what is shown their mate. Afanasievo was genetically just like Yamnaya and totally different from Sintashta. Xiahoe R1a was Z93- and if Afanasievo was R1a they were certainly Z93- but I nevertheless except them to be R1b-Z2103. Not sure but he is older than Sintashta i think, some Eneolithic aDNA from Central Asia is needed..
You are a descendant of northwesterners and accept that. Sintashta was Lithuanian-like and genetically more Western than Udmurts and even less Yamnaya-like than them. All points to a western origin of Sintashta especially their EEF ancestry certainly insignificant in BMAC. Yamnaya was closer to Pre-IE Central Asia than Sintashta because Pre-IE farmers of Central Asia were Georgian-like just like the Near Eastern ancestry of Yamnaya. Sintashta and Lithuanians? well its very problematic, anyway,IMO Lithuanians can even come from an eastwards migration, i mean they even have Ashvin gods! BMAC we don't have aDNA yet, its not wise to make conclusions of Genetic structure on BMAC, but i'm certain it will have R1a-Z93 as its also a part of the Indo-Iranian sphere. Nevertheless you show no evidences and just personal biases. I have given you a reference, read it, if you think it has wrongs ask questions. "The Poltavka R1a guy was a genetic outliner and was very similar to Sintashta and Srubnaya." What? That was mentioned in the paper? That would be an interesting find, because that'd make him an immigrant. Yes, look at the PCA of the paper. Poltavka R1a is far away from other Poltavka samples and close to Sintashta. It is probably not totally accurate but they also labeled him as outliner in the paper and he was either a foreigner, recently assimilated or maybe he is even mislabeled as Poltavka. He was also found at another site than the R1b Poltavka guys. His grave was found at Potapovka and is older than the graves of R1b Poltavka guys. That is quite confusing and maybe he is ancestral to later Potapovka of the same place. 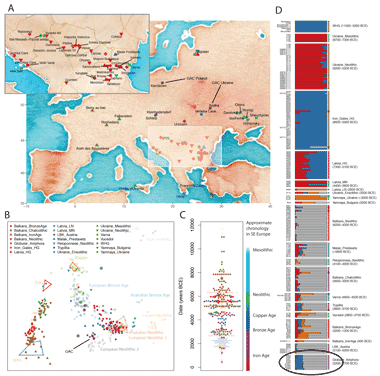 I have tons of respect for the genius and hard work of the people who have sampled almost 300 ancient genomes. It's an unbelievable gift for people interested, it's like going back in time. But I still am frustrated that they didn't the second time around sample Steppe-folk from outside of Samara!! Samara is a dead end. There's a good chance early R1a-M417 and R1b-L151 were somewhere West of Samara. And the best way to find out Steppe autosmal impact is to sample ones from the West who likely admixed with EEF. If they're interested in the Indo European question they need to start sampling early IEs in Asia. Sample Hittites, sample Bronze age Indo Aryans in India, sample the ancestors of Persians, etc. Of course sample Pre-IE people to see if there was any change. Eventually they have to leave the IE-question and I can see them in the next 20 years getting 1,000s of ancient genomes from all over the world. I guess you're right. He must have been from an early wave of R1a-Z93 into the Steppe from somewhere in the West. To get R1a-Z94 in Russia that's 500 years older than Sintashta is a big deal. If they're interested in the Indo European question they need to start sampling early IEs in Asia. Sample Hittites, sample Bronze age Indo Aryans in India, sample the ancestors of Persians, etc. Of course sample Pre-IE people to see if there was any change. See? this is the strategy mostly so far when sample taking is concerned, they will only take samples from sites ''they think'' is IE or of ''IE period'', to get things really going they must start taking samples from Eneolithic Asia at least, this why i was very happy when i found out that Pinhasi took Samples from EN/MES Iran. Eventually they have to leave the IE-question and I can see them in the next 20 years getting 1,000s of ancient genomes from all over the world. I hope and i believe that the great IE question is destined to be solved in our lifetime, one thing though ancient scripts i think have the supreme authority, not genetics but in the absence of the first we have to rely on the second. "It is unclear how the Srubnaya acquired farmer ancestry. One possibility is that contact between early farmer and steppe populations produced populations of mixed ancestry that migrated eastward to the Samara district and further east to form the Sintashta/Andronovo populations. A different possibility suggested in Ref. 1 is that the Corded Ware population of central/northern Europe migrated into the steppe. Our new data document the existence of farmer-admixed steppe populations in the European steppe and provide a plausible source for the more eastward migrations of such populations. Further evidence for a connection between the Srubnaya and populations of central/south Asia—which is absent in ancient central Europeans including people of the Corded Ware culture and is nearly absent in present-day Europeans23—is provided by the occurrence in four Srubnaya and one Poltavka males of haplogroup R1a-Z93 which is common in present-day central/south Asians and Bronze Age people from the Altai24 (Supplementary Data Table 1). This represents a direct link between the European steppe and central/south Asia, an intriguing observation that may be related to the spread of Indo-European languages in that direction." We need really more aDNA from Ukraine, Belarus, Poland and forest steppe/forest Russia. EEF Farmers arrived in Belarus 4000 BC and arrived 3000 BC already in Eastern Belarus so the ancestors of Sintashta/Srubnaya/Potapovka don't need to originate in Central Europe to be so EEF admixed. Especially when Ukraine had a large farmer population in the West. His grave was located very close to the forests steppe and dig through an older local grave. Z93/Z94 was in my opinion for the most time living on the border between the forest-steppe and steppe. It seems that Yamnaya/Poltavka folks had a great impact on the material culture of archaic Indo-Iranians and Potapovka people reused older Poltavka graves. That is probably also the reason why archaeologist assumed in the past that Indo-Iranians originate from Eastern Yamnaya/Poltavka. This contacts probably explain the linguistic similarities between Indo-Iranian and Greek. Some linguists even thought that Greek and Indo-Iranian have a common linguistic ancestor and according to some linguists there are more linguistic similarities between Indo-Iranian and Greek than between Indo-Iranian and Balto-Slavic. Nirjhar pointed to an article by Mallory where he points to a number of issues with the Steppe theory. One of them is that there is no archaeological evidence for growing cereals east of the Dnepr in the PIE time frame i.e. before 2000 BC. But there are quite a number of identifiable words describing these cereals traceable in Indo-Iranian - or eastern IE - languages, which have followed all the developments within that language-family. That seems odd, as the proto-indo-iranians migrated to well established argicultural societies. Why would they retain words so long, while not using them, but ignoring the new cultures who do have words for them? So this could be part of the solution. That is, if the time frame matches and the influx could be just on time to a) account for the start of cereal growing and b) account for the very little local developments that made different branches of PIE grow apart. But Nirjhar's statement to which I replied was not about Mallory's article but about the new Mathieson et al. paper. I know, but your reply shows something which triggered my interest. That jolr.ru is an interesting read. I dumbfounded how idiotic that last sentence in the quoted paragraph is. Are the authors trying to argue a bunch of South Asians migrated North and created the Timber grave culture? They did look at the autosomal DNA of samples they took right? Do modern South Asians even have EEF like ancestry? Most South Asians do show some EEF-related ancestry. The authors are saying that Indo-European languages spread from the direction of the steppe to South Asia. But you're right, it's not worded clearly. I was talking about this sentence, David. It's idiotic. _"Further evidence that migrations originating as far west as central Europe may not have had an important impact on the Late Bronze Age steppe comes from the fact that the Srubnaya possess exclusively (n=6) R1a Y chromosomes (Extended Data Table 1), and four of them (and one Poltavka male) belonged to haplogroup R1a-Z93 which is common in central/south Asians12, very rare in present-day Europeans, and absent in all ancient central Europeans studied to date." What they're saying there is that Z93 might be from somewhere like western Yamnaya, rather than Central Europe. I actually talked over e-mail to one of the authors about this. But again, it's probably not worded too well. I read the article. It does not devalue the Kurgan hypothesis relative to the other major PIE urheimat hyptheses as it is equally or more critical of them and compares the major urheimat hypotheses only on a very limited number of variables. True. The people (In this case Nirjhar) who seem to advocate other urheimats and put up this paper as evidence don't realize it is far worse for their theories. The issues Mallory raises can't be solved by them either, and Indo-European language evolution becomes extremely hard to explain with those. The reason I pointed you to this is that the Srubnaya EEF admixture may be part of the solution of the second issue Mallory raises. Since Sintashta is the first Steppe culture confirmed to be EEF-bearing and it begins roughly in 2000 BC, maybe it was the first cereal-farming culture in the Steppe and Tocharian and Indo-Iranian descended from it one way or another. Afanasievo does not have to be the ancestor of Tocharian. I think the whole "Indo-Aryan" theory is nothing but a scientific bias contrived to hide a mainly proto-Slavic, Slavic and Eurasian spread of civilisation from eastern Europe! I have enough reason to believe that the first people to domesticate horses and cattle, lived in eastern Europe and that they spread their civilisation and genes, throughout Asia and Middle East... Just follow the trail of genes and LP alleles if linguistics isn't your forte and judge by who has the oldest ruins.